With the 2018 U SPORTS Men’s Soccer Championship now in the history books, and Montreal Carabins crowned as Canadian college champs for the first time in the school’s history, all eyes are now on the first ever U SPORTS Canadian Premier League draft, the results of which are set to be announced Tuesday. With all seven CPL head coaches and their management teams in Vancouver to watch this week’s nationals, this was a chance for players to shine, leave a lasting impression on the watching coaches, and pave a way for a professional future for themselves in the game. And many did just that. The CPL draft is a game changer for these young Canadian college players. Long overlooked by the MLS draft, U Sports (or CIS as it was previously known) has managed to produce the likes of Vancouver Whitecaps’ Brett Levis and former MLSer Nana Attakora. The new draft will provide players with one to four years of remaining college eligibility an opportunity to sign a CPL-U SPORTS Developmental Contract to play with a CPL club in the spring and summer, while preserving their college eligibility to allow them to return to U SPORTS competition in the fall on August 15th. Graduating senior players will also be a part of the draft and eligible to sign full professional contracts. It’s a much needed partnership that will hopefully stop a number of top talents from slipping through the cracks, providing opportunities for many to dip their toes into the professional ranks, and set many on their journey to become full time professional footballers. 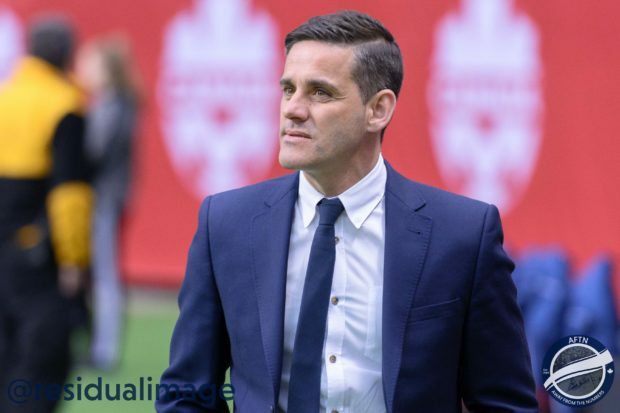 For Canadian men’s national team head coach John Herdman, it’s an exciting development and one that he feels will only add to the strength of the player pool at his disposal in years to come. “I had a chance on Wednesday to meet with the CPL coaches in Vancouver and with some of key CPL leaders,” Herdman told us. “We had a good chance to sit down and chat about the future. Sharing vision, ideas, philosophies. I think the big take on the draft is that we’re connecting our country. We’re connecting our country in ways that we’ve never done before. The talent on display across the board at this year’s U Sports nationals was exceptional and the CPL coaches certainly won’t be short of players to choose from. Players like UBC’s former Whitecap, the Canada West and U SPORTS Rookie of the Year and Canada West Player of the Year, Thomas Gardner feel like a shoe-in to be taken, as does someone like Carleton’s Gabriel Bitar who exuded quality throughout, while HFX Wanderers will certainly be taking a lot of close looks at the talented Cape Breton Capers squad. Coast to coast talent being signed to a coast to coast Canadian professional league. It’s long overdue. “It’s just exciting,” Herdman added. “It’s exciting to see that we are starting to connect our game at the right time. It’s almost serendipitous that we’ve all had the same sort of thoughts at the same time to bring our game together. With 2026 around the corner, you would hope that these sort of things are starting the bear fruit. It won’t just be the Canadian players that are eligible to be drafted. Nationality will not matter and all players that remain in the college system will be classed as domestics until they graduate. The plan is not only to make Canada and the CPL attractive to overseas talent (the recent CPL trials in Victoria saw six players fly in from Japan and others from the US and Mexico), increasing the overall quality initially, but to be an attractive proposition to all Canadian talent, no matter where they are currently plying their trade, and it could have huge ramifications for the U SPORTS system in attracting the top young talent to Canadian schools instead of them going for NCAA scholarships. “This is how we’re seeing a longer term vision for this game. That we know that the path to professional football is very non-linear and having these springboards like university and the connection, the formal connection, into pro football, is going to make a big difference to us.